Ian Holloway loves the referencing the Barclays bit of the Premier League name! Part one of this two-part post touched on the good things that Blackpool have sustained over their twenty-eight games this season and those are things that will help to ensure that Blackpool give as good as they get through to the season end. However, out of the original ten ways for Blackpool to stay in the Premier League, there are four critical elements that Blackpool are struggling with. 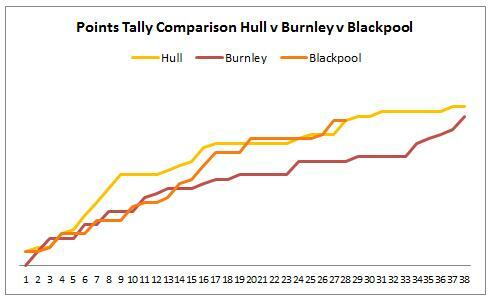 This post will touch upon those and their impact on the chances of Blackpool achieving the improbable dream. The original article was written at the time that Blackpool were starting to find some resolve in defence; a solid performance against Wolves and a good 70 minutes against Bolton was followed up with two back to back clean sheets against Stoke and Sunderland. However, since then Blackpool have really struggled to get their basics right and this has constantly dragged down otherwise strong performances. This was covered at length in a recent article called dissecting the defence. Intended to uncover how Blackpool’s defence worked, it appropriately defined what the opposition are doing to Blackpool. A combination of poor basics and poor positioning has been under pinned by injuries to key personnel and Ian Holloway has struggled to keep a regular back four together. Stephen Crainey has missed the last six games and it would be no surprise should he return, and Blackpool recover their composure. He may lack pace over short distance to recover position, but he makes up for that with assurance in possession of the ball, strength in the tackle and adventure on the break. In fact since the original article was written goals are being conceded at a rate exceeding the earlier part of the season rising from 1.93 to a nice and round 2.00 goals per game. A point of interest to note is that in the period of Crainey’s absence the goals conceded per game jumped to almost another goal per game at 2.83. Again this has been rolled out on the blog quite a few times recently and none more so when it was defined that there had been a noticeable drop in Blackpool’s pass completion rate. The impact of this means that opposition teams are now seeing more of the ball and Blackpool are keeping it less and consequently losing their grip on games. Since the original post, pass completion has dropped from 75% to 72% for total passes. 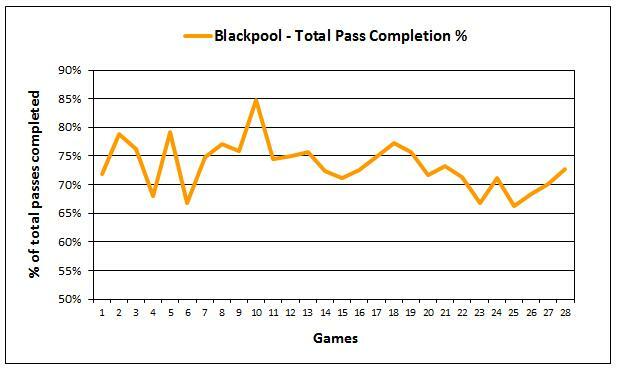 In number of pass terms this equates to Blackpool conceding on average a total of 34 less completed passes per game. Dropping off, oh but look, it that a sign of recovery? One observation though; note how it has picked up recently. The signs of a recovery? Monday’s game against Chelsea will be an interesting benchmark! Well they did finally and it is now important for Blackpool to find their rhythm in collecting points again. A repeat of the recent five consecutive defeats at this stage of the season would be potentially catastrophic. Look at the table below to see how Blackpool had been progressing in points mapped against Hull’s progress from their first season in the Premier League. Notice the flat line on Hull’s tally, if Blackpool can avoid stringing multiple defeats together then that tally line will keep climbing and they’ll get closer to safety. This is clearly a huge weakness for Blackpool and one that hasn’t gone away. Speculation can go on all day long about fitness levels, experience and ability however, Blackpool are vulnerable as the game skips on to the final quarter. The chart below shows that Blackpool have conceded 17 goals in the final quarter which accounts for 31% of the total goals they’ve conceded. 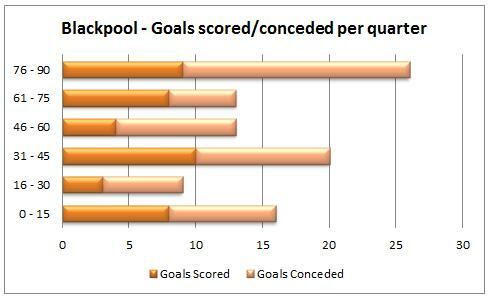 Prior to the last article Blackpool had conceded 9 goals in the last quarter and the last thirteen games they’ve done the same, leaking a further 8 goals, so no improvement there; and as a result games have been lost from leading positions in that period. Most notably against Manchester United and Everton. Crumbling like a crumbly thing in the final stages of games. These are very critical factors and quite clearly should Blackpool get stuck in a rut again, it will be due to defensive frailties, poor ball retention leading to intolerable opposition pressure in the final quarter of games. Just getting some defensive solidity and better passing for a handful of the last ten games will surely be enough (in tandem with those aspects from part one) to keep Blackpool where some people doubted they could be for a second season.